Aarsun Woods Bring to your home the best of decorative room divider and privacy screens to bring completeness to existing home decor. 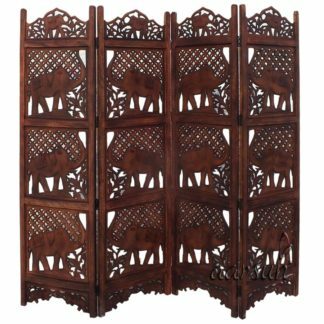 Just have a look over the Mango Wooden Room Divider 4 Panel Carved Screens; it is ultimate in its category.four panel wooden room divider in rich antique deep chestnut featuring intricately carved floral motif and lattice details.In addition to this, you can also wrap this alluring Wooden Room Dividers to your near and dear ones. There is beautiful wooden carving done by our skilled artisans in very traditional manner.As the room divider are best way to separate your puja room from other area or it give more importance to your unused space.The wood we use in making divider are highly durable and free from fungus. There are a number of shades & designs available in Wooden Room Dividers, we recommended you to have a look at Sheesham Wood Room Dividers , also at Mango Wood & MDF Wooden Room Dividers.